Think stuffed chicken is hard? 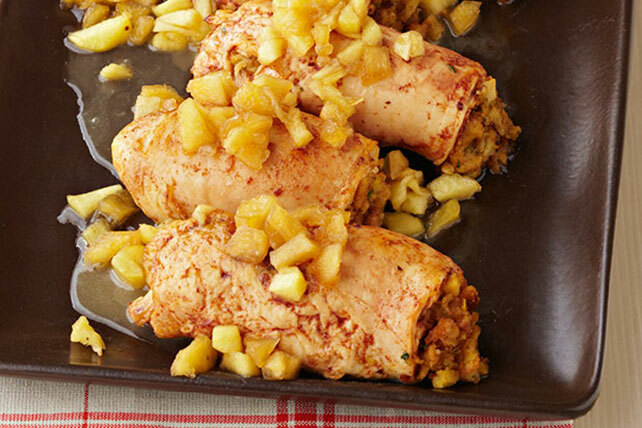 This easy recipe with a cider glaze, apples and celery will make you think again. Combine stuffing mix, 1-1/2 cups cider and 1 Tbsp. butter in microwaveable bowl; cover with waxed paper. Microwave on HIGH 5 to 6 min. or until heated through. Fluff with fork. Add celery and half the apples; mix lightly. Place chicken, top-sides down, on cutting board; spread with stuffing. Roll up, starting at one short end of each breast. Place, seam-sides down, in 13x9-inch baking dish sprayed with cooking spray. Melt 1 Tbsp. of the remaining butter; mix with paprika. Brush onto chicken. Bake 40 min. or until chicken is done (165ºF). Transfer chicken to platter; cover to keep warm. Melt 1 Tbsp. of the remaining butter in medium skillet on medium-high heat. Add sugar, remaining cider and apples; cook 5 to 6 min. or until thickened, stirring frequently. Remove from heat; stir in remaining butter until melted. Pour over chicken. Place chicken in freezer-weight resealable plastic bag, then pound with the side of a heavy can, rolling pin or mallet until desired thickness.